Waterproof up to 20 m able to withstand drops of 2.1 m onto a 5 cm thick plywood surface while on (measured according to RICOH’s in-house version of the Pentagon MIL-Standard 810F Method 516.5–Shock drop test); able to withstand loads of 100 kg (measured according to in-house tests); and resistant to ethanol, sodium hypochlorite, and liquid chlorine dioxide. 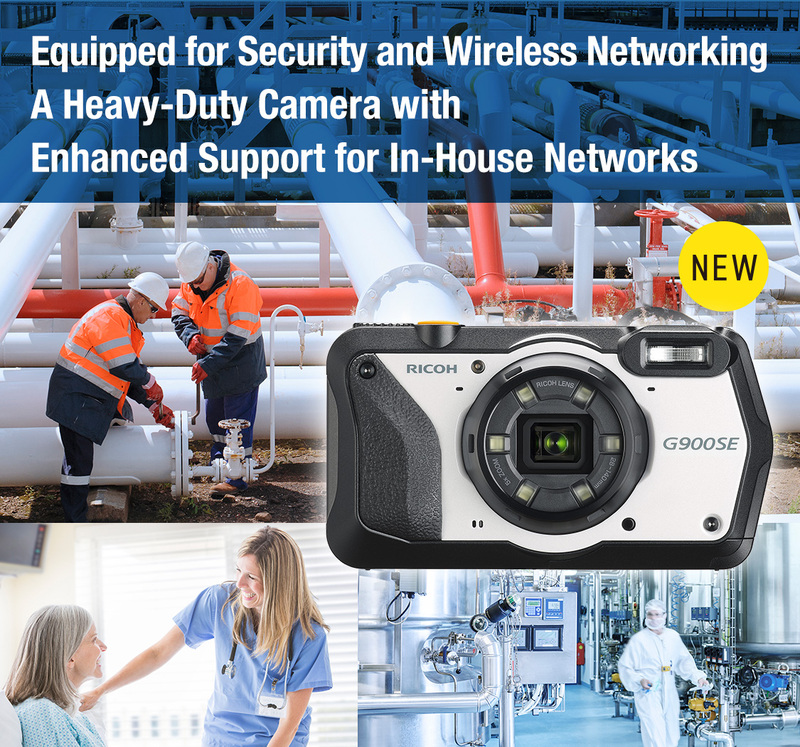 The camera features built-in Bluetooth® version 3.0/4.2 BLE and wireless LAN IEEE 802.11 a/b/g/n/ac 2.4/5 GHz, features that can be used for high-speed wireless connections not only to computers but also to smartphones and other devices. The camera even supports WPS (Wi-Fi Protected Setup™) for easy wireless setup and can receive location data from external GPS devices compatible with Bluetooth® version 3.0/4.2. 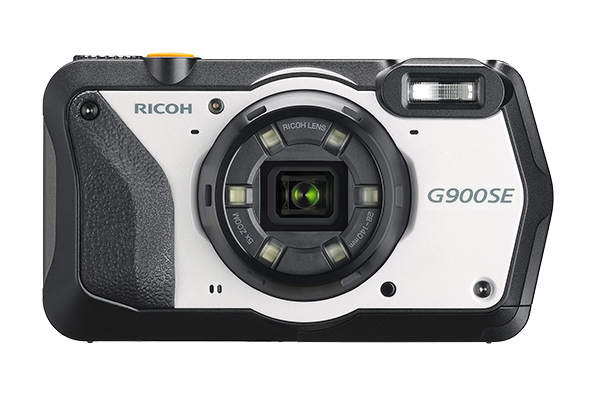 The RICOH G900SE supports IEEE 802.1x wireless LAN authentication, a highly secure method that uses credentials supplied by a RADIUS server. Cameras can be managed in-house or on in-house networks. Update firmware simultaneously on multiple cameras and otherwise reduce administrator workload and improve system integration. The same tasks can also be performed using SD memory cards. The bundled EX2 application software can be used to export data in the highly-portable XML format for improved file-sharing. Password-protect access to any or all camera features, including camera controls, menu access, internal memory viewing, and USB connection. Choose separate administrator and user passwords for greater control over security. Access can be granted by scanning a password barcode or entering the password using the camera’s onscreen keyboard. The camera supports MIFARE, FeliCa, and ISO1443 TypeA/B contactless NFC cards, letting users unlock the camera simply by tapping it with a card. Card data can be linked to camera memos so that the camera can, for example, retrieve the user’s name from a previously-prepared list and record it when tapped with a company ID card.